When you think bench you probably imagine something in a park or what you pull up to the kids table during holidays. And while many people think of a bench as just a bench – an afterthought to other staples of home decor – with a few clever bench decor ideas, a bench can easily become your favorite piece of furniture. Benches are incredibly versatile and can be used in so many different ways. This makes them great investment pieces as you can repurpose them over and over when you move or get tired of seeing it in one spot. Using one of our favorite multipurpose benches from Unison, we rounded up 5 of our favorite bench decor ideas to show you the many amazing ways to put a bench to work in your home. Read on for 5 bench decor ideas and see if there’s a place for this versatile piece in your home. In busy households, there’s always a lot of traffic at the front door. A bench is a handy place to sit while taking off or putting on your shoes. They also have that handy area underneath the seat where you can put a basket to keep clutter tidy and out of the way, but still accessible when you need it. We love the look of Unison’s Stippled Black Bench – it’s plush and comfy and the dark, textured fabric is great for kid-friendly households. 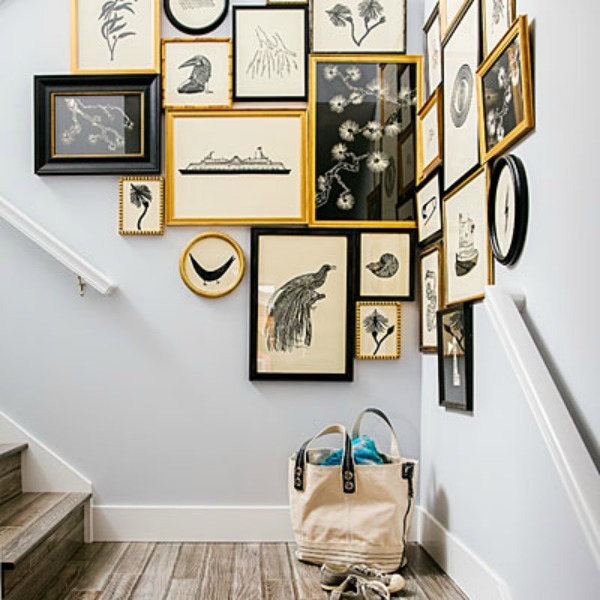 Need a little extra help containing the entryway clutter? Try a storage bench for a convenient place to stash winter boots, shoes, or umbrellas in a pinch! Plot twist – You can even use a bench in place of a coffee table. If that’s a puzzling notion, picture this: benches are ideal for small spaces where you need what little furniture you can fit, to pack an extra punch. By using a bench – like this Mesh Gray number from Unison – you get the same amount of surface area as a coffee table, but you can also use it as a foot rest or extra seating for guests. Stylist tip: Place a tray on top of your bench to create a more sturdy surface to rest drinks and TV remotes. If you’ve ever dabbled in the advanced art of “floating” a sofa – not a magic trick but a layout hack that can do wonders for your living room – then you may have asked yourself, what the heck do I do with the empty space in the back? And – you guessed it – one way to have your sofa’s back is with a bench! This gives you another space for storage, a place for guests to put their purses or jackets, and can be easily pulled into the main living space as an extra seat for company. Every bedroom needs a place to sleep, but fully functional rooms also give you a place to sit while you get ready. One of our favorite bench decor ideas is to place a bench at the foot of your bed. This gives you somewhere to sit and put on your shoes, plan your outfit, or plop your purse or bag at the end of the day (and keep your bed clear and clean!). A bench at the end of the bed is not only an attractive addition to your room, it’s practical as well. Open floor plans are great if you want a breezy space with great flow. However, they can cause a bit of a design conundrum if you struggle to separate the space into distinct zones. If this sounds familiar, try using a bench to create a sense of division between the dining area and living areas, or the play space and entertaining room. Unlike a full wall, it won’t add any visual bulk to your space, and you can still appreciate the open layout while creating distinct zones or “rooms within rooms” in your space. Are you struggling to redesign your home? When you sign up for a Modsy design package, you’ll get expert design plans laid out in a 3D version of your home. Then you can shop your look, knowing exactly how all the pieces will look and fit in your home. Ready for a design experience that’s guess-free and stress-free?